Immunohistochemical analysis of paraffin-embedded Human tonsil cancer tissue using at dilution 1/20. 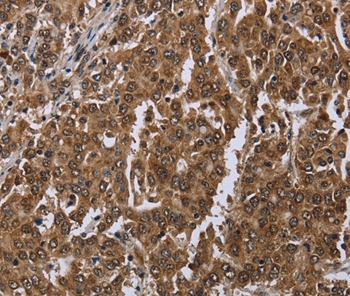 Immunohistochemical analysis of paraffin-embedded Human liver cancer tissue using at dilution 1/20. SET9, also known as SET7/9, is a member of the SET-domain-containing methyltransferase family that is expressed widely in pancreatic islets. It specifically methylates histone H3 Lys4 (H3K4) and is involved in the transcriptional activation of genes. SET9 is useful to researchers studying human diseases and the complex process of histone methylation and is thought to play a role in diabetes and inflammation. 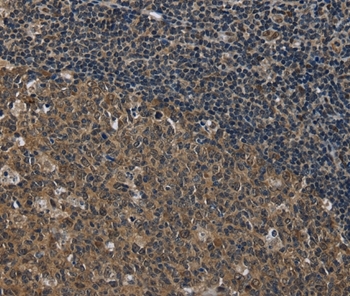 SET9 Polyclonal Antibody. Unconjugated. Raised in: Rabbit. Rabbit IgG in pH7.3 PBS, 0.05% NaN3, 50% Glycerol.